While corn maturity and harvest are still some time away, it is never too early to be aware of potential challenges to crop growth and development and harvest. Are you at risk of leaving some ears behind? As ears fill out and eventually begin to mature and dry down, corn plants become very top-heavy. Stalk rots increase the chance that plants will fall over (lodge) due to a combination of gravity and weather. In addition to being not-so-fun to harvest, lodged plants can significantly decrease harvestable yield by literally leaving some ears on the ground. Stress conditions favor stalk rots. 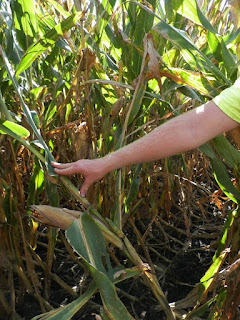 The combination of mid-season environmental conditions that favor kernel-set followed by conditions that stress plants increases the risk of stalk rot. This year, weather conditions in much of Northwestern Minnesota were relatively mild during silking and pollen shed, favoring good kernel set. However, since then much of the crop has experienced abnormally dry or even moderate drought conditions during grain-fill (Fenimore, 2017). Kernels place a very high demand on the plant for sugars. Stress reduces the rate of photosynthesis, thereby reducing how much sugar that the plant is able to produce. If unable to keep up with kernel sugar demand, the plant can remobilize sugars from other plant parts, including stalks. Many different stresses can reduce a crop’s rate of photosynthesis: too much or too little moisture; nutrient imbalances; leaf injury (ex. : hail, insect, disease); high plant populations; and even long-periods of cloudy weather. Low stalk sugar content can increase a plant’s susceptibility to stalk rot pathogens. Many of the fungi that cause common stalk rots survive in corn residue and so those practices that slow residue degradation (ie: continuous corn and conservation tillage) can increase the risk of stalk rot. Yield losses attributed to stalk rot diseases were estimated at between 28.4 and 43.9 million bushels per year in Minnesota in the 2012 through 2015 growing years (Mueller et al., 2016). Scouting for lodging potential. Scouting for stalk rots is essential to minimize harvest losses. Begin scouting fields just before physiological maturity (black layer) or when grain moisture is between 30 and 40 percent. Walk each field in a zigzag pattern, checking random plants from multiple areas of each field. To check a plant for stalk strength, either pinch it or push it. For the pinch test, pinch stalks toward the bottom, above the lowest visible node, checking for firmness. For the push test, push the plant 30 degrees from vertical and see whether it returns to an upright position and the stalk remains intact (Figure). With either test, there is a significant lodging potential if 10 to 15 percent of the plants fail your particular test. Harvesting first those fields with the greatest lodging potential reduces the chances of having to harvest lodged corn. If you are unable to get into the field before the crop lodges, remember to drive slowly and harvest against the grain. How can I reduce risk? While there is not much that can be done with Mother Nature’s whims, do what you can to reduce crop stress by following Extension-recommended agronomic practices. In more southerly regions where foliar disease pressure can sometimes be severe, scouting fields and treating with foliar fungicides when warranted can reduce risk of stalk rots. Depending upon which stalk rot disease is most prevalent in a particular field, sometimes further extending the crop rotation away from corn and other plant hosts and/or more aggressively managing residue can reduce risk. Hybrids vary in their susceptibility to common stalk rots. Look into purchasing seed with good ratings for individual stalk rot diseases, and good lodging or standability ratings. Freije, A., Wise, K. and Nielsen, R. 2016. Diseases of corn: Stalk rots. Purdue Extension publication BP-89-W. Online. Fenimore, C. U.S. Aug. 22, 2017. U.S. Drought Monitor. National Drought Mitigation Center. Mueller, D.S. et al. 2016. Corn yield loss estimates due to diseases in the United States and Ontario, Canada from 2012 to 2015. Plant Health Progress. 17:211-222. Online.